Just north of Shoreditch, nestled in Haggerston, is a pleasant surprise - a quirky, atmospheric little cocktail bar, ideal to while away an afternoon, an evening or even an entire weekend. Before giving any recommendation, it wouldn't be right if we didn't test it out for you so one chilly Saturday afternoon, we headed over to East London to be warmed up with a cocktail or two. Walking into Map Maison is like walking into an another world. There's an abundance of plants and bold décor. The tables are laden with cake stands of éclairs and macaroons and there's a cocktail making class going on at the bar, where the barman is perfecting a cocktail in a cage, which has dry smoke escaping from it. This bar is exuberating weekend vibes and we're feeling at home immediately. A long, slim space, Map Maison, which has been open for 2 years, feels intimate, as the team have worked hard to make sure it's a relaxed experience where you don't feel rushed out the door when you've finished your drinks. Heidi, who works at Map Maison tells us, "Our regulars come back to Map Maison over and over again because of the atmosphere and the service. The attention to detail that has gone into the décor, lighting, music and our cocktails make it a home from home and we want to pair the highest level of service with the warmth, personality and expertise of the team delivering it." 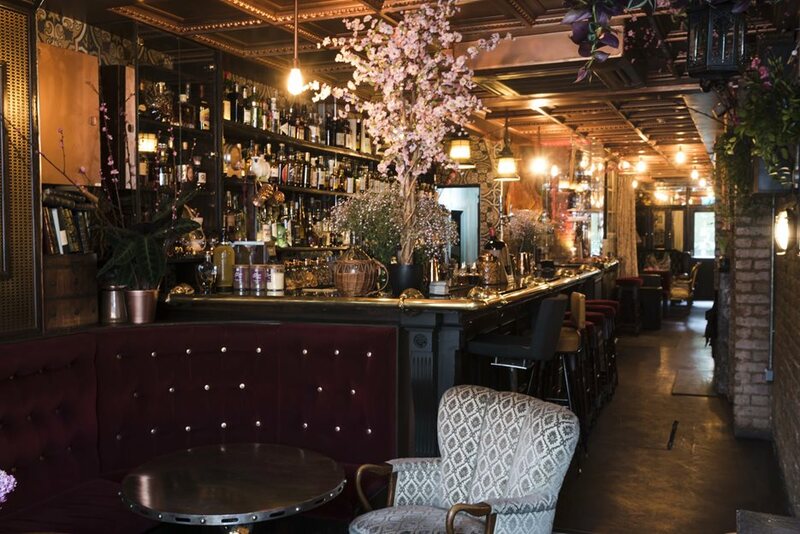 "The owners were really keen on Japanese whisky and considering the peaked interest over the last few years, they decided that should be the theme of the bar. This has led Map Maison to now hold the second largest Japanese Whisky collection in the UK. 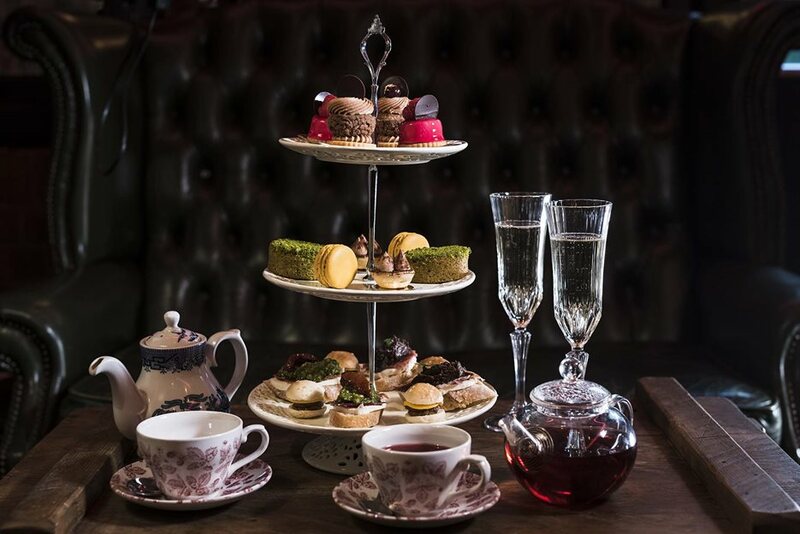 We are also currently serving a Spring themed Afternoon Tea with specially paired Japanese gin and whiskey masterclasses." We opt for an Afternoon Tea with some cocktails from the 'Japanese Cocktail' list, whilst watching two guys having a cocktail making class next to us. The Afternoon Tea is a treat - with a bit of a hipster twist - no triangular sandwiches here, it's slider burgers, avo on sourdough bread and a mouthwatering range of cakes to keep us going. Everything is absolutely delicious, and slid down nicely with our 'Taste of Amalfi' and 'Rosemary Martini' cocktails. You can definitely lose track of time sat in Map Maison, and several hours later we come out of our snoozy slumber and leave the bar full, satisfied and ready to face a new working week. Map Maison is an amazing venue to visit for anyone who enjoys the beauty and craft of cocktails and food. You can experience something different or learn something new with the Afternoon Teas or Masterclasses. Or if you just want a cocktail or a coffee in a cosy retreat, this venue is perfect for you too. Why not take advantage of our incredible offers there today. Enquire on their site and mention you have a Portico Places card to get various discounts at the venue now.